I know almost zero lore for the entire Elder Scrolls franchise, mainly because first-person RPGs never tripped my trigger. However, it’s great to see players who have followed it so closely that they ask some fantastic questions and I enjoy learning along with the rest of the community. Get some new insight into the lore of The Elder Scrolls Online in our latest round of Q&A. Today’s group of questions, all chosen from your submissions, focuses primarily on lore. Many of you care deeply about The Elder Scrolls setting, and you always have lots of great questions for us about what you’ll get to see in ESO. Please enjoy these new answers, and don’t forget to send your questions to community@elderscrollsonline.com. We do a new Ask Us Anything every two weeks, and we may feature your question in the next article. There will be adventures set in the Alik’r Desert port town of Tava’s Blessing, which is the precursor of Lainlyn. You will meet members of the Lainlyn family, for whom the town will later be renamed, and there are adventures in the desert with harpies, but that’s all we’ll reveal at present! Thanks to the treaty with the Daggerfall Covenant, Orsinium has been restored to the Orcs of Wrothgar, and they are rebuilding and reoccupying it. Southern Wrothgar is under the control of King Kurog of Orsinium, but north of the city the region is still a patchwork of strongholds. Though the Reachmen are related to the Bretons, they consider themselves a separate race (and so do the Bretons). The Reachmen are not a playable race, as they’re basically enemies to everyone (and like it that way), but you will see them causing trouble in High Rock, Hammerfell, Skyrim, and even Cyrodiil. The Forsworn are a Fourth-Era faction of the Reachmen that actually hearkens back to the Reach culture of ESO’s era, so they don’t appear as such, but the Reachmen of our time resemble them. From the shores of the Iliac Bay you can see the Adamantine Tower rising from the heights of Balfiera Island. Can you visit it? Time will tell. Orcs live in strongholds in the mountains throughout northern Tamriel. Most of them keep to themselves, staying out of the wars of Men and Elves. The Orcs of Wrothgar, who are signatories to the Daggerfall Covenant, are the exception, having long had ambitions of nationhood. As mentioned above, the Orcs of Wrothgar have long been ambitious to have their own state, and these ambitions have been repeatedly crushed over the millennia. Their membership in the Covenant is one more attempt at organization and recognition. The selection and accession of a new Mane is, in fact, one of the key events in which players can get involved in northern Valenwood and western Elsweyr. How is a new Mane chosen and accepted? You’ll get to see for yourself. 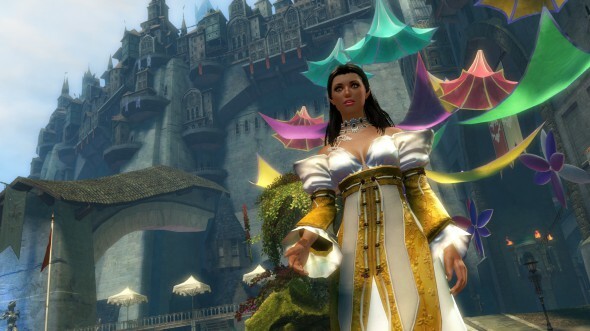 Angel McCoy has written a short story for ArenaNet. It’s a bit “late”, but I’m hoping GW2 lore continues to expand like this. I miss how TERA’s lore was shared extensively with dozens of exclusive articles, lore stories, and even a Twitter follow-along for one character. The original article is over here. Scribe’s Note: The following journal page was retrieved, undoubtedly without permission, from the Zephyr Sanctum, and in 1326 it came into the hands of the Durmand Priory. The author remains unidentified, and the veracity and authenticity of this account has not been verified. Believe at your own risk. Exhaustion and heat may kill us before we get out of here, if the minor irritations don’t get us first. The desert winds blow sand into everything. The grains are like tiny biting mites that get between your skin and your clothes, cling to your scalp, and grind between your toes. My companions have remained taciturn throughout our journey, and as we approach the battlegrounds, we’ve stopped conversing about anything nonessential to our survival. We’re too exhausted to do anything but plod onward. It’s as if the wind, sun, and weather were conspiring to slow our progress. I’m beginning to understand why someone keen on security would make this the location of her lair. Our trek into the Crystal Desert has taken weeks longer than expected. The weather has proven unpredictable, but we have finally arrived at our destination. I write this now from a hill overlooking the battlefield. An air of solemnity rises from the sand in waves like the shimmer of heat, making it difficult to breath. This is where Destiny’s Edge confronted the crystal dragon, and where our protector died defending us from her Elder kin. I imagine I can see the crystalline remains of her corpse from here. Tomorrow, we will know. Our predecessors, the dwarven Brotherhood, knew she was different. They forged an alliance with her and let her into their minds. They guarded her legacy for as long as they could, but sadly, their race was not to live forever. Destiny decided otherwise, and thus the torch was passed to my ancestors. We hid ourselves away for hundreds of years, helping her as we could and keeping her secrets. It breaks my heart that we did not witness her final moments. She’d lived for millennia, and yet was gone in the blink of an eye. We’re coming here to retrieve whatever remains of her magical corpus, so that her sacred bones won’t fall into the wrong hands. Dragons consume magic, but they do not destroy it. They hold it within themselves like a sponge holds water. I only hope we’re faster than the scavengers and power-mongers who would use her body to advance their own evil or selfish plots. I know now what great value there is in her crystal remains. Holding a portion of her in my hand, I was able to walk on the wind, ride the lightning, and channel the sun to my will. We will take her back with us and build a new sanctum where we can rise above the mundane violence of the world. There, we will foster peace and seed the crystals we make with touches of her magic, so that others too can experience her legacy. I write with some confidence that once we leave this forsaken desert landscape, I will never return. It’s everything we are not: inhospitable, lifeless, and cruel. We’ll take her to a resting place with fresh breezes and gentle sunshine. She deserves nothing less. She was as old as the Shiverpeaks, older than the gods. None will ever hear her true name spoken properly. And so we will remember her only as Glint, the one and only dragon who fought the destruction of our world. While we live, she will never be forgotten.